A Leigh family has launched a heartfelt plea for support in helping their poorly son walk again. Jacob Cowley, six, was diagnosed with cerebral palsy when he was just a baby. He has never been able to walk unaided and has been wheelchair-bound since undergoing double hip surgery in the summer. Jacob undergoes a tough physiotherapy regime on a daily basis, being placed into a frame which stretches his body out and mimics a standing stance, to strengthen his legs. Unfortunately, the NHS is unable to fund as many sessions as he needs and his parents James and Jessica are looking to private therapy sessions instead. “He could recover quicker with more physio, but private therapy costs thousands of pounds,” said dad James, 32. James also spoke about his son’s brave fight against the condition and the moment they realised all was not well. Jacob was born at 36 weeks and it wasn’t long before the couple noticed that Jacob wasn’t behaving like most other babies. “He wasn’t sitting up, he wasn’t crawling around,” said James. “Our GP said he was a late developer. He said he’ll kick on, he’ll get there eventually. But our health visitor wasn’t happy and referred us to paediatrics. In his short life so far, Jacob has started every morning with a long leg-stretching routine, to stop his muscles tightening too much and allow him to move around with a walking aid. Unfortunately, Jacob’s hips dislocated earlier this year after his muscles got too tight and he was rushed into double hip reconstruction surgery at Alder Hey Children’s Hospital. He has been on a long road to recovery ever since and it will be at least two years before he will be able to walk again, James said. “He takes it in his stride. He just takes it, he works hard, he’s a very determined little boy. And little brother Jonah also helps out, according to James. The two-year-old is always eager to bring toys to Jacob whenever he is unable to get them himself. 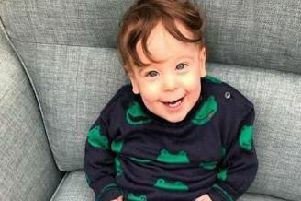 James and Jessica have now launched a crowdfunding page in a bid to help fund Jacob’s recovery, which would go towards more frequent private therapy sessions.